Streams of the River: Holy Innocents' Day and Martin Scorsese's "Silence"
Holy Innocents' Day and Martin Scorsese's "Silence"
The day after Christmas Day is the feast of St Stephen, the first Christian martyr, reminding us that following Jesus has meant pain and sacrifice for some. Then the 27th December is the feast of St John, Apostle and Evangelist, whose teaching on the Incarnation lies at the very heart of our faith. Today we remember the blood flowing in the streets of Bethlehem as all the boys under two years of age (the "Holy Innocents") were slaughtered by order of Herod the Great, the Governor of Galilee. This Herod was an extremely cruel man. He killed a number of his wives and sons when he thought they were plotting against him. Every challenge to his power was met with a swift and final response. Threatened by the birth of a king prophesied in the Jewish scriptures, Herod - enraged by the "betrayal" of the Magi - ordered the killing of all the baby boys in Bethlehem two years of age and younger. Here is a meditation on today's feast by scientist/ priest John Polkinghorne, from his book Living with hope: a scientist looks at Advent, Christmas, and Epiphany. 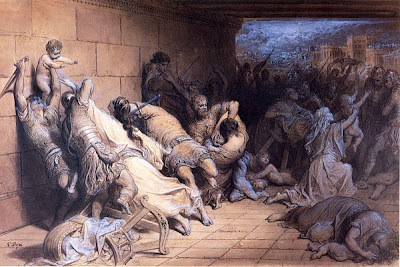 Three days after the joyous Feast of Christmas comes the sad remembrance of the Holy Innocents, the children slaughtered at the command of the ruthless King Herod as he sought to protect himself from any threat to the tenure of his throne. If Jesus had not been born, and if the magi had not called in at Jerusalem in the course of their search for him, naively inquiring where the new King of the Jews had been born, those children would have lived on into adult life. The adoration of the magi and the slaughter of the innocents are opposite sides of the same coin. Those mothers weeping in Bethlehem are the shadow side of the Christmas story. Holy Innocents Day sets before us, with peculiar intensity and sharpness, the strange character of this present world, with its mixture of joy and sorrow, promise and pain. We are glad indeed that the Christ child was born, but why did it have to be at the cost of the deaths of his tiny contemporaries? Why did God not intervene to stop the massacre of the innocents? Come to that, why did God not intervene to stop Auschwitz? One of the saddest sights of that terrible place is a room where the Nazi guards piled up shoes taken from those who were about to enter the gas chambers. Thousands of pairs are stacked there, each one representing some person whose life was untimely destroyed. Many of those shoes are children's shoes. Before the mystery of suffering we necessarily fall silent. We can understand that God has given humans free will and that this means that it can be, and it is, exercised in ways that are totally contrary to the divine purpose. But the bitterness of suffering is too great to be assuaged by logical arguments of this kind, true though they are in their own way. If there is to be a theological response to the problem of suffering, it has to lie much deeper than that. I believe that the Christian response does indeed lie very deep, for it speaks of a God who is not simply a compassionate spectator of the travail of creation but One who, in the cross of Christ, has actually, participated in that suffering. God is truly a fellow sufferer with creation, for the Christian God is the crucified God. The life of the baby Jesus was saved by the flight into Egypt, but there was a cup waiting, prepared for him to drink, and when the time came, he drained it to the dregs. I have long been an ardent fan of Martin Scorsese’s films. Taxi Driver, Raging Bull, Goodfellas, The Aviator, Gangs of New York, The Last Waltz, Casino, etc. are among the defining movies of the last 40 years. And The Departed, Scorsese’s 2007 crime drama, was the subject matter of the first YouTube commentary that I ever did. It is certainly the case, furthermore, that the director’s Catholicism, however mitigated and conflicted, comes through in most of his work. 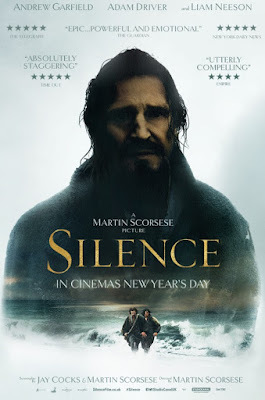 His most recent offering, the much-anticipated Silence, based upon the Shusaku Endo novel of the same name, is a worthy addition to the Scorsese oeuvre. Like so many of his other films, it is marked by gorgeous cinematography, outstanding performances from both lead and supporting actors, a gripping narrative, and enough thematic complexity to keep you thinking for the foreseeable future. The story is set in mid-17th century Japan, where a fierce persecution of the Catholic faith is underway. To this dangerous country come two young Jesuit priests (played by Adam Driver and Andrew Garfield), spiritual descendants of St. Francis Xavier, sent to find Fr. Ferreira, their mentor and seminary professor who, rumor has it, had apostatized under torture and actually gone over to the other side. Immediately upon arriving onshore, they are met by a small group of Japanese Christians who had been maintaining their faith underground for many years. Due to the extreme danger, the young priests are forced into hiding during the day, but they are able to engage in clandestine ministry at night: baptizing, catechizing, confessing, celebrating the Mass. In rather short order, however, the authorities get wind of their presence, and suspected Christians are rounded up and tortured in the hopes of luring the priests out into the open. The single most memorable scene in the film, at least for me, was the sea-side crucifixion of four of these courageous lay believers. Tied to crosses by the shore, they are, in the course of several days, buffeted by the incoming tide until they drown. Afterwards, their bodies are placed on pyres of straw and they are burned to ashes, appearing for all the world like holocausts offered to the Lord. What in the world do we make of this strange and disturbing story? Like any great film or novel, Silence obviously resists a univocal or one-sided interpretation. In fact, almost all of the commentaries that I have read, especially from religious people, emphasize how Silencebeautifully brings forward the complex, layered, ambiguous nature of faith. Fully acknowledging the profound psychological and spiritual truth of that claim, I wonder whether I might add a somewhat dissenting voice to the conversation? I would like to propose a comparison, altogether warranted by the instincts of a one-time soldier named Ignatius of Loyola, who founded the Jesuit order to which all the Silence missionaries belonged. Suppose a small team of highly-trained American special ops was smuggled behind enemy lines for a dangerous mission. Suppose furthermore that they were aided by loyal civilians on the ground, who were eventually captured and proved willing to die rather than betray the mission. Suppose finally that the troops themselves were eventually detained and, under torture, renounced their loyalty to the United States, joined their opponents and lived comfortable lives under the aegis of their former enemies. Would anyone be eager to celebrate the layered complexity and rich ambiguity of their patriotism? Wouldn’t we see them rather straightforwardly as cowards and traitors? What betrayal of those lay Christians! Cowards and they were priests who are meant to be an example to the rest of us. I hope that priests in places like Syria and Iraq stand shoulder to shoulder with their parishioners when under siege.